Alhamdulilah! We have finally had our first snow and was it a big one! I must first say, my lil guy AB said it snowed so much because he made du'a for lots of snow,masha Allah. He is my lil du'a maker,Alhamdulilah! We have 20 inches of snow outside of our house right now! The wind was treacherous,so kids had to wait to go out and play. We did watch abi "dig" us out! This is a short video of what we saw once we opened the door! Zawj didn't know where to start it was so overwhelming! 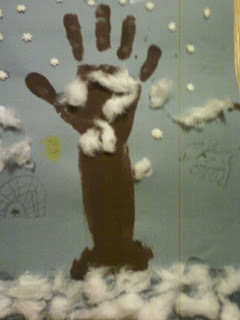 I have always loved the snow, growing up we did everything in the snow. We built igloos,went sledding,had snowball fights. This is something I had wanted my children to have a love for,and masha Allah they do. I think all children love snow,don't you? We decided to do a little winter snow day crafting! 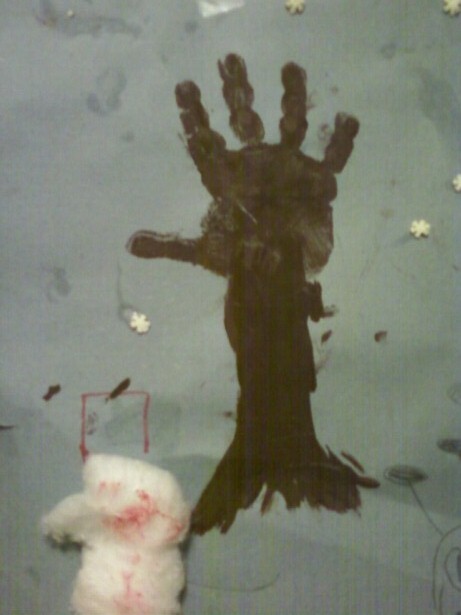 we made some winter scenes with handprint trees! 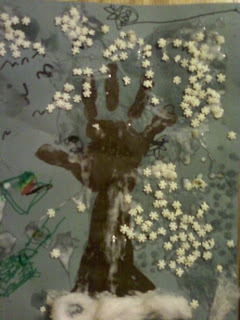 This is my 3 yr olds tree, he used confetti snowflakes and cotton! My 5 yr old added an igloo~! 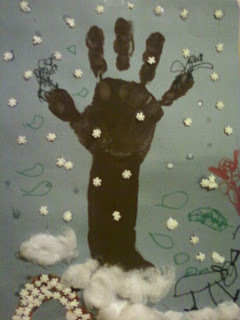 My 7 yr old added cotton for snow! My 20 month old even participated! 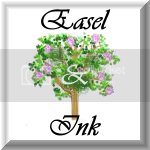 What a great keepsake! Simple, but fun craft for all ages,masha Allah. I hope all my sisters are keeping warm and enjoying the winter season and all that Allah has blessed us with!